Nowadays a lot of companies are trying to build-up their digital platform because the market is changing. Customers are digitally connected and demand a high level of service with a real (digital) customer experience. Competitors are entering the market with new business models made possible by the speed of innovations. 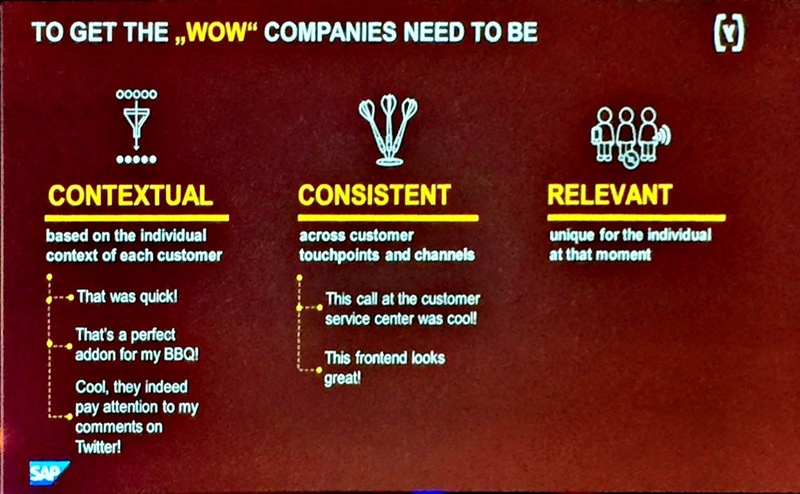 Companies are looking for new ways to get in touch with the customer and want to be distinctive, creating magic moments, to stay ahead of their competitors. So, its all about knowing your customer, thoroughly. Companies want to become digital masters and don’t want to be digitally disrupted. 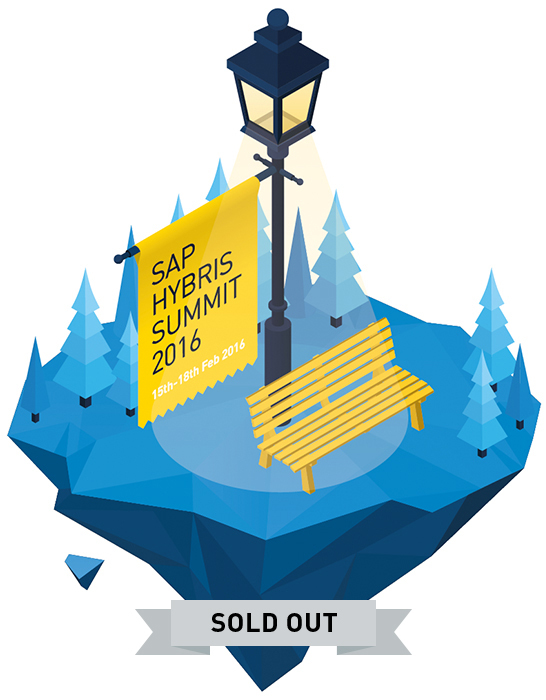 From Monday February 15th until Wednesday February 17th Acorel visited the SAP Hybris Summit in Munich, Germany. At the moment the SAP Hybris Summit is the main SAP event in the area of Customer Engagement and Commerce. Important leaders like Carsten Thoma, President & General Manager SAP Hybris, Brian Walker, Chief Strategy Officer SAP Hybris and Pascal Matzke, VP Research Director Forrester and interesting customer stories from Asics, Samsung, T-Systems, Alfa Laval, Arco, Trek Bikes, Office Depot, Tata Steel showed customers and partners the direction and new solutions towards the SAP Hybris digital platform. Solutions like SAP Cloud for Customer (SAP C4C) supporting all sales, customer service and field service processes mobile and in-company are already known. In our blogs we give a lot of attention to SAP C4C and also the SAP Hybris Summit showed us a lot on how sales and service people can achieve their goals by giving them easy access to customer information, real-time analytics, social selling, service ticketing, case management, problem resolution and service execution anytime anywhere. Marketing processes are covered by SAP Hybris Marketing. SAP Hybris Marketing gives your marketing team easy-to-use tools to deliver exceptional customer engagement across all channels. Despite the fact that mass-marketing is still considered effective for the generation of brand-awareness, maximizing the effectiveness of the marketing funnel can now be taken to the next level using this state-of-the-art solution. SAP Hybris Marketing helps your company create magic moments or WOW! moments like they called it at the Summit. To get WOW! companies you need to be contextual, consistent and relevant. So, its all about understanding the customer, creating segments of one, easy, multichannel and intelligent campaign execution with marketing automation, understanding customer journeys to drive conversion and loyalty. 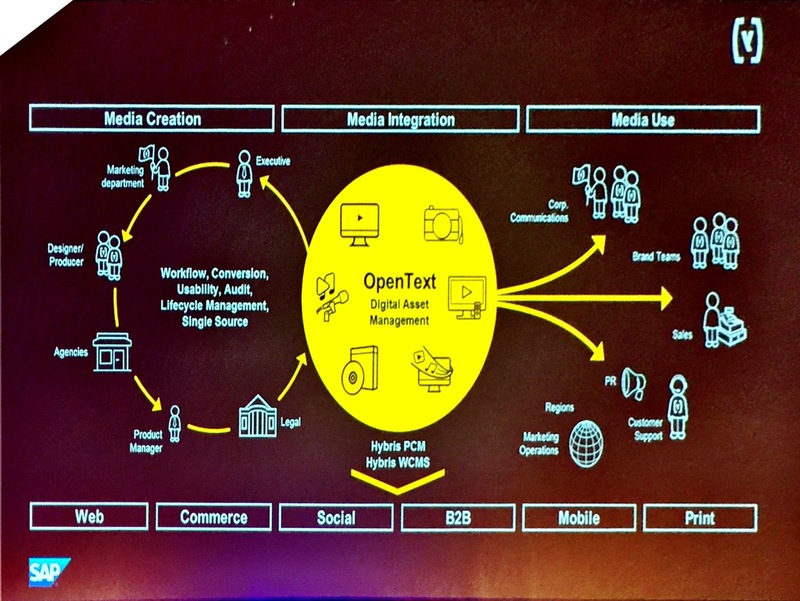 The SAP Hybris Summit also showed us new stuff in the eCommerce area. The SAP Hybris eCommerce platform delivers a contextual, personalized omni-channel shopping experience to mobile, social and website shoppers. In the new release 6.0 the sales organization structure will be added and the back office cockpit will be extended with order management so the eCommerce suite can become more backend independent as well. Also the Accelerators are extended and the implementation methodology ALF (Application Lifecycle Framework) is introduced so project timeliness can be improved and shortened. 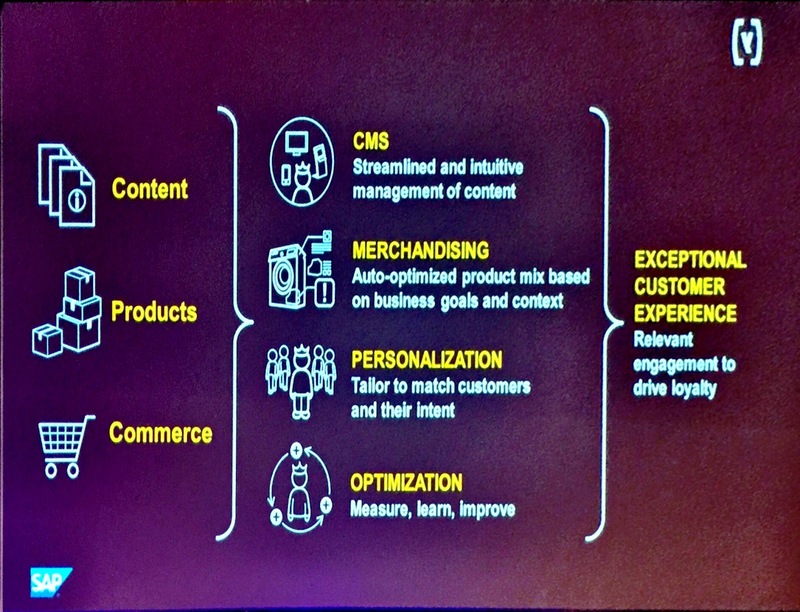 New in the eCommerce area is SAP Hybris Customer Experience (SAP CX). This tool offers easy, intuitive management of content and personalization. With SmartEdit you can instantly add banners, drag and drop pictures, adjust your text and preview your site in a mobile view. No developer needed. With Merchandising you can adjust, optimize and preview your product recommendation strategy based on e.g. highest margin, most interest, highest selling and lowest price. No expert needed. Both personalization and auto-optimized product recommendations can be made user-group specific. So, it really becomes easy to create an exceptional customer experience and to drive loyalty via your eCommerce channel. Introduced last year September and getting a lot of attention on the SAP Hybris Summit: SAP Hybris Profile. The demos on this solution looked really great. With SAP Hybris Profile all customer interactions and behaviours are captured, analysed and shown to you as a continually evolving contextual profile. SAP Hybris profile is a graph database with nodes and relations, representing all customer interactions like web sessions, product views, twitter posts in a really fancy way. This will give you real-time insights in one-to-one engagements with every customer across all touch points. You can interpret customer data, identify key customer opportunities, and anticipate the best actions in sales, service, marketing, or commerce applications to engage customers. 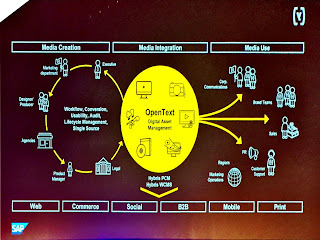 New to me was the SAP Hybris Digital Asset Management solution with Open Text. This tool supports your corporate communication, brand, sales, support and marketing teams on media creation and media usage. It delivers workflow, conversion, audit, single source and lifecycle management during the media creation and usage process. SAP Hybris DAM is integrated with PCM and WCMS in SAP Hybris eCommerce and SAP Hybris Marketing. 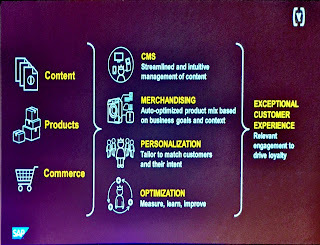 The SAP Hybris suite supports more and more end-to-end processes between SAP Hybris eCommerce, SAP Hybris Marketing, SAP ERP/CRM or SAP C4C and is becoming a real competitive digital platform! I enjoyed the Summit very much. It always inspires me a lot to meet new people and to see nice new solutions to help our customers. Hopefully I inspired you a bit as well with this blog. Excuse me on the quality of the pictures in this blog. These are actual photos from the Summit.